Billy Foster: Get down. Get down. Ellison: [Turns to Bootney's guards] Call the police. Bill Cosby and Sidney Poitier play working class men who want to get rich. They come up with $20,000 for a scheme, but $18,000 of that comes from their lodge's building fund. The men take their wives to New Orleans and, while there, they see an opportunity in an inept boxer, played by Jimmie Walker, who has the opportunity to win the middleweight title. 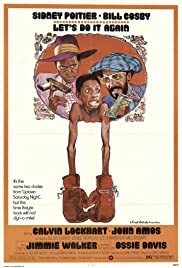 Poitier hypnotizes the boxer and makes him very confident, and the men pose as New York millionaires and place bets with a bookie (well played by John Amos) who later figures out what they did and wants to take advantage of the situation, possibly bringing down rival Biggie Smalls. Cosby is his usual self, only hipper (especially when he dresses in wild outfits to pretend to be rich). It's a real pleasure to see Poitier in a role that you can laugh at, since most of his characters have been so sophisticated. The two men together are great, especially when they are trying to get out of jams. I especially enjoyed seeing Cosby pretend to be a big-time gangster while talking on the phone. Walker, of course, was one of the best buffoons in 1970s TV, and he doesn't disappoint here. Even when his character is confident and talented, he still has that cartoonish quality about him. Curtis Mayfield's music, with vocal performances by the Staples Singers, added a lot to the movie. It wasn't quite a family movie, but it was quite clean compared to similar movies being made today, with very little cursing and not much to really object to.